The German city of Nuremberg’s annual Toy Fair is far and away the biggest of its kind anywhere, with sheer size something of a mind-boggler - the venue boasts some 160,000 square metres (nearly 40 acres! ), providing room for nearly 2700 hobby, toy and craft manufacturers to display their wares. Whether your thing is plastic kits, radio-control, model trains, diecasts, they’re all at Nuremberg for your delectation, as are clear pointers to the latest trends in upcoming products. This year is the the 61st such show and the organizers are expecting 76,000-plus visitors to visit before the turnstiles close tomorrow. And many of those showgoers will be poring over the wares of long-standing exhibitor, Japan’s Tamiya, which is at Nuremberg this year for the 44th time in succession. 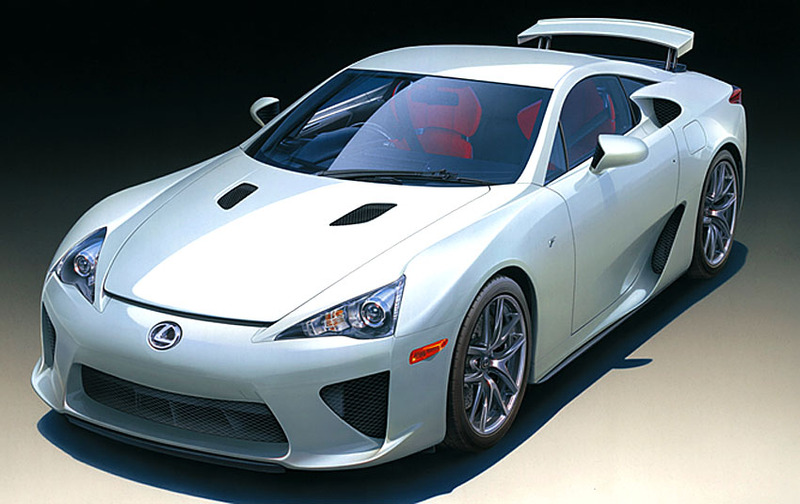 Let’s focus in on a hotly-awaited item, the Tamiya 1:24 scale Toyota LFA performance car. The real thing is not exactly new, having been in development since the early 2000s, with a first prototype displayed in 2005. 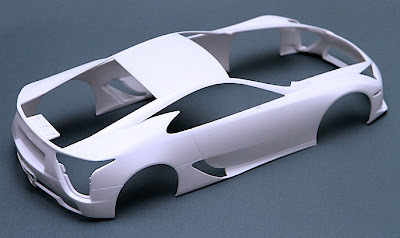 However, the 200 mph-plus (322 km/h) supercar is now in production at about 20 a month to a proposed limit of 500 maximum. It’s certainly a head-turner and has been tested by much of the motoring press, whose reactions include a rave review from Richard Hammond of the BBC Top Gear TV show. So it can’t be too bad then, if ‘The Hamster’ likes it! As you can see from the pictures above, the Tamiya LFA kit looks well up to the high standards set by Tamiya over the years, with attention to detail that’s second to none. 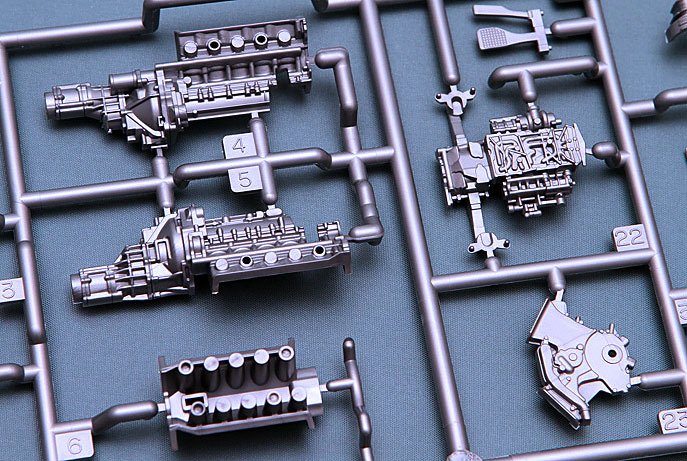 Tamiya’s ultra-sharp mouldings are still the envy of the industry, and you’ll be pleased by the precise treatment of the LFA’s components. The kit’s interior is a close match to the real thing, while the engine and drive-train is a work of delight, and good enough to merit its own mini-display on Tamiya’s Nuremberg stand. And that’s a thought - buy two kits, and then you can show off this section separately on your own model shelf. Other new items we can expect soon include the tasty treats listed below. A pity there are no aircraft kits there, as Tamiya’s award-winning 1:32 scale Spitfire has set a very high bar for the next aviation release. 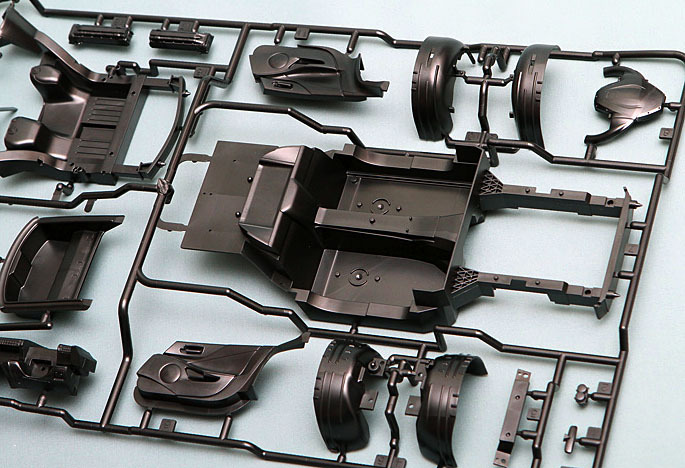 Howzabout a half-and-half solid-transparent version, Tamiya? The Tamiya LFA is available soon, meantime the company does some other extremely handsome Toyotas here. Other Tamiya car kits are here. 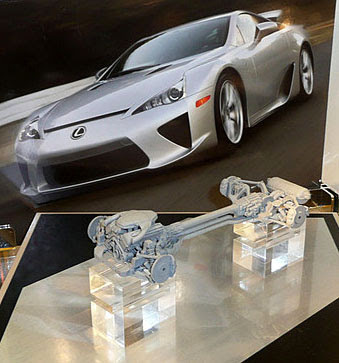 1-4 Detail pix of the Tamiya LFA kit. 5 Tamiya LFA drive-train displayed at Nuremberg 2011. 6 Cockpit of the real thing. 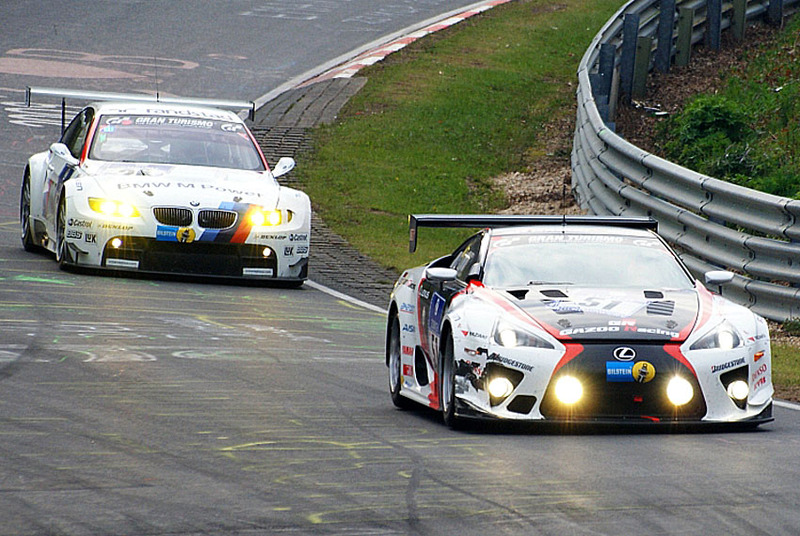 7 LFA and BMW M3 racing at the Nurburgring track, May 2010. 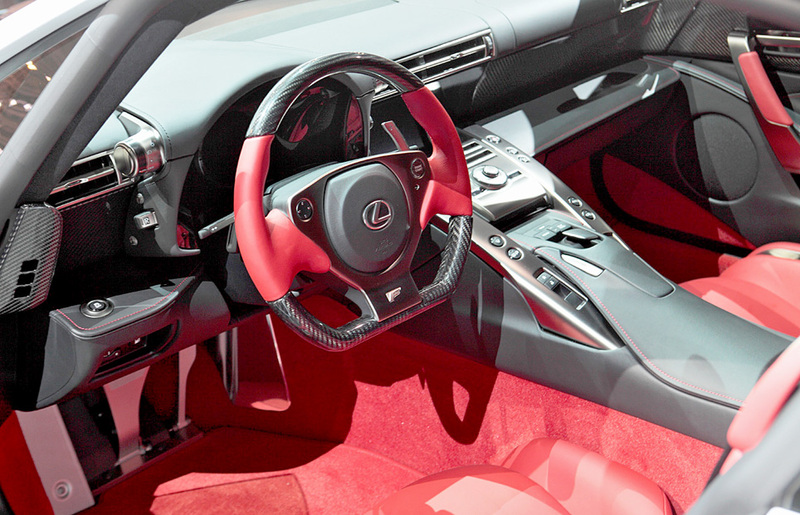 LFA drivetrain pic courtesy Toy Collector. Nurburgring pic courtesy the German photographer ‘mariechen’. Other pix courtesy Tamiya, SMN studio.